OK. you clicked on that weird looking thing on the shop diagram wondering what the hell it is. It's a Robland X31! The Robland X31 is a five function, three 3 hp 220V TEFC motors. 1,100+ pound, $6,000 beast. This is NOT a ShopSmith nor any of its cousins. 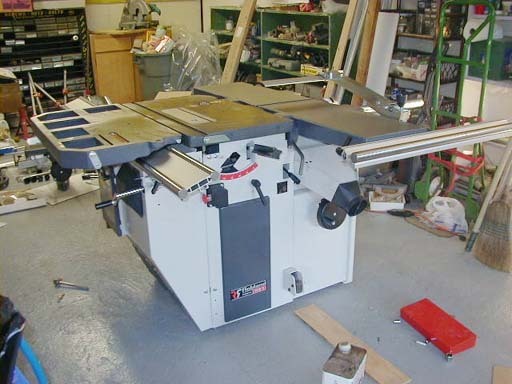 If you have limited shop space (don't we all) the X31 gives you a lot of functionality/capabiities in a relatively small footprint. Now before you go into sticker shock at the price tag look at what you get with the X31. First, you get a 3 hp TEFC motor for the 10 inch blade table saw WITH a sliding table and 48+ inch cross cutting capability. The saw's Splitter/Riving Knife wraps closely around almost all of the rear quarter of the exposed blade to keep the saw kerf open, even very close to the blade. This helps minimize kickback. Note: the X31 can handle a stacked dado blade. 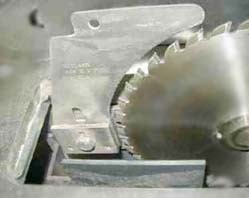 Many European machines will not permit the use of a dado blade - European Union safety laws outlaw "blind cuts" (cuts made without the blade being visible). Here's the saw in ripping mode. Note the lever below the GrrRipper (the yellow thing -it's a JoinTech product/invention). Rather than a wheel to raise and lower the blade, the X31 comes with a lever handle. You lock/unlock the lever by twisting the handle. Fine setting the blade height is a "nudge and bump" process. 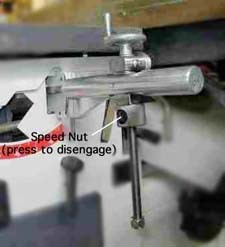 A member of the Yahoo X31 users group, Brian Lamb, came up with a modifiaction which allows for the quick rough setting of the blade using the lever and then adds a small wheel to permit very fine adjustments. Tim Rowledge, a local member/owner with machine shop experience made several and I bought one of them. Works great. Thank you Brian and Tim ! The really nice feature of the X31 is the sliding table with a cam levered hold down and a short (shown here) and long (52 inch) miter fences with a flip stop. You can cross cut or miter long and/or wide stock nicely but it's the ability to handle sheet stock that really makes the sliding table a joy. 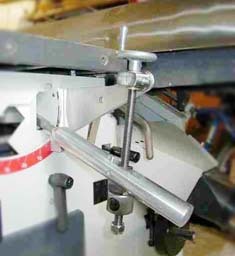 The rails on which the sliding table rides can be pulled foreward to allow cutting a a 4x8 sheet into 4x any width you want. You need a couple of outrigger roller stands for wide stuff but it works really well. 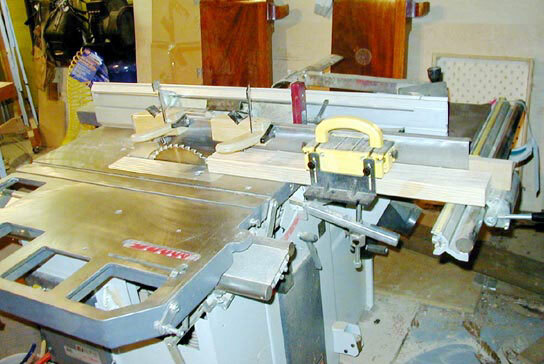 The sliding table and its fence also comes in handy when used with the shaper - provides good stock control. 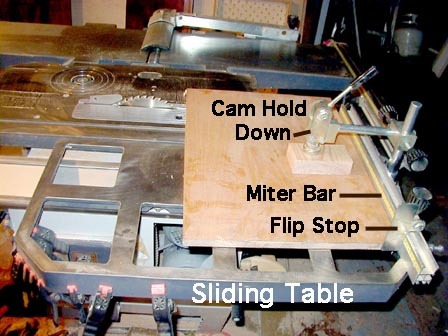 BUT - if you have to set up re-set up the sliding table for any reason it can be a royal PITA - UNLESS you have the Robland Factory Rail Setting Jigs. Fortunately for me, I had the pleasure of visting the Robland Factory in Brugge, Belgium in the summer of 2001. Yves Damman, the factory manager picked me up at the train station and took me to the factory where I spent over four hours watching Chris and Yanick put together six French model Robland X31s.. When I saw the rail setting jigs I thought I'd found the Holy Grail!